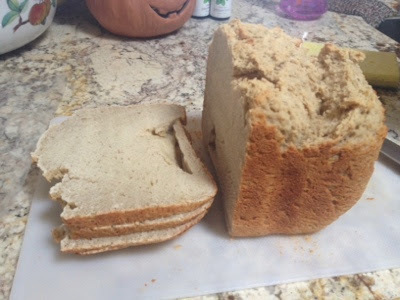 This was my second attempt at making GF/V bread. 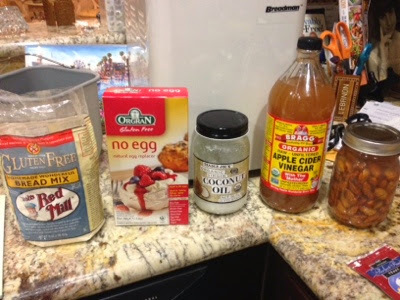 I used the Red Mill bread mix, Orgran no egg, apple cider vinegar, homemade almond milk, and coconut oil. I followed the mixing instructions on the package and cooked it in a bread maker. It turned out lumpy looking but tasted great! My first time i used banana instead of milk (ya seriously that was all i had) and it tasted fairly good. it had this weird hint of banana that wasn't as strong and nice as banana bread but it was still good and i ate it all the time.